Brrrr…. it was chilly last night – and again this morning. Living on a boat comes with its own share of fears. Sinking – obviously is the big one. But at this time of year flooding is another. You only have to watch the London Boaters forums to spot boats capsizing; boats becoming untied from their moorings and boat owners suffering thousands of pounds of damage due to the weather. On Tuesday we had to have all our ropes loosened for fear of the boat being pulled over by the extraordinary rising tides. Yesterday, in response to the very high tides on the Thames, the Thames barrier was raised and the risk of flooding to areas of London was removed. For us. No damage and no issues. Phew! Pleased that I’d come home to a safe boat I got the stove going, and set to making this very simple yet unusual dish for our dinner last night. A traditional mimosa salad is a layered salad with a grated egg yolk base. This isn’t that. This really is quite different – much like the Quinoa risotto isn’t really a risotto! Taken from Anna Jones – A Modern Way to Cook – this recipe uses the dressing that is usually made with the mimosa salad and dresses tenderstem broccoli and asparagus instead. The eggs are kept separate and don’t see the dressing until you eat it! The dressing is simply a Chardonnay White Wine Vinegar, olive oil, dijon mustard and a finely chopped shallot, seasoned well. To this you add your lightly steamed broccoli and asparagus – and then some thickly sliced avocado. Meanwhile, some hard boiled eggs are grated, seasoned, and mixed with creme fraiche and lemon zest. You can then either stir in some chopped dill – or keep it separate like I did. There’s nothing else to this dish. It is very simple and very tasty. It’s visually very pleasing too. Make sure it is seasoned well or it is in danger of being a bit bland. If you don’t have tasty enough avocados (they can be a bit tasteless this time of year) squeeze half a lemon over them to pep them up a bit. I loved it – but didn’t feel as full up as I have from other meals. Maybe I was just cold. It was very cold last night! This week has been a week of very simple dishes. This was done in less than 30 minutes. Tomorrow I have more time so I plan on spending a bit more time in the kitchen. I’ll be making the last three dishes I’ve chosen from Anna Jones’s book and then I’ll move onto something different. This dinner was a game of two halves. The beans – awesome; the fritters – not so good. This recipe is taken from Anna Jones – A Modern Way to Cook, and was one of those where I kind of figured what the result would be before I made it. In fairness even the author doesn’t sing its praises; simply saying ‘a good quick dinner’ – I should have known better! On one side we had a homemade take on baked beans, only so much better than what you get in a tin – while on the other side we had hash browns which ended up being more like mini frittatas. A lot of recipes substitute potato for sweet potato and hope it will work. Unfortunately it doesn’t work here. The sweet potato is flavoured only with a small amount of cumin seeds and is bound together with egg. It didn’t take a lot of working out to realise these patties were going to be eggy and generally lacking in taste. For me they were a bit of a fail. I’ve made fritters with sweet potatoes before and they have been better because the potato has been roasted first and the flavours have been developed by adding spring onion or soy sauce. Blitzing the roasted veg with other ingredients and then forming the patties seems more successful. These raw ones are disappointing. You can’t really get enough flavour into them, they don’t tend to keep their shape unless you are very careful with them and they tend to lose their integrity as you eat them. Perhaps a pinch of chilli flakes would have woken them up a bit. I might try that some other time. The beans on the other hand were excellent. Having fried a shallot with some smoked paprika and adding some really tasty cherry tomatoes you add cannellini beans, a little thyme and a dash of balsamic vinegar. These are super tasty and would be a great side. I could see myself whipping up a big batch of these and having them with burgers and fries or something like that. Not such a successful dinner – but very healthy and a great bean discovery. 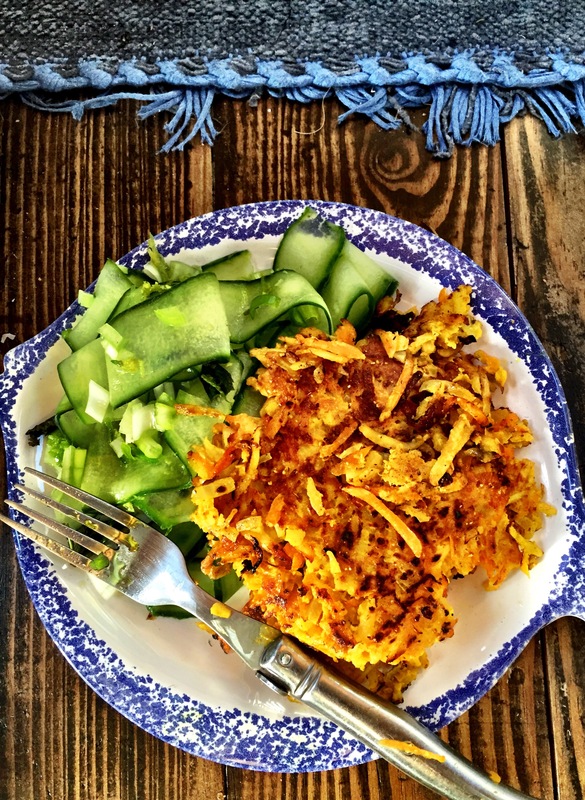 Here’s another recipe from Anna Jones – A Modern Way to Cook. Kale, Sumac and Crispy Rice Salad is a dish I’ve made before but not with all the correct ingredients. It was one of those where I improvised a bit when I was not really up for cooking and it wasn’t as good as it could have been. More on that later! Unlike yesterday’s Sweet Potato and Quinoa Bowl, this dish can definitely be made in 20 minutes. It doesn’t get much simpler than this – especially if you buy your Kale from Morrisons; they sell it already shredded in bags so you don’t have to do too much. Cook some brown basmati rice until it is ready; usually around 15 minutes – and while you are waiting do the rest. Shred your Kale (if it isn’t already) and squeeze the juice and zest of lemon over it. Add some salt and scrunch it all together for a minute to allow the acid in the lemon to start breaking down the tough Kale. To the Kale you add some chopped spring onions and some roughly chopped Medjool dates. Last time I made this I used some regular dates but it wasn’t so good as the dates were too firm and chewy. When your rice is cooked, drained and cooled a bit you dry fry it in a frying pan to remove all the moisture – then fry it again in some coconut oil to crisp it up. You need to be careful here not to over crisp the rice as it become very crunchy and difficult to eat – so keep an eye on it and test it from time to time – as soon as it seems like it’s firming up turn the pan off and sprinkle with some salt. Finally, bringing it all together, we make the dressing which is simply the zest and juice of a lime, some Sumac, and some olive oil – shaken then poured over the Kale and Crispy rice. Crispy rice might not be everyone’s cup of tea; but it adds a lovely contrast to the Kale if you get it right – just don’t overdo it! I loved this dish. It makes loads, and you feel like you are overeating because your bowl is so full – but then you realise it’s just Kale and power on through enjoying the citrus hit with every mouthful. I can thoroughly recommend this very easy dish. Back to the dates; what are Medjool dates and why are they preferred in this book? Medjool dates are picked when their ripe and juicy, and don’t last as long on the shelf, which is why they’re typically much pricier. Regular dates are picked when they’re rock solid and inedible and are then steamed for a while to loosen them up. They have a longer shelf life, and are much cheaper. I’m lucky enough to have a Syrian supermarket on my High Street and they have lots of dates to choose from; but only one box of Medjool dates – £7.99 for a box – but it’s a big box and it will last! Now here is a salad that you just have to make. Also from Persiana by Sabrina Ghayour this salad is incredibly simple and amazingly tasty. 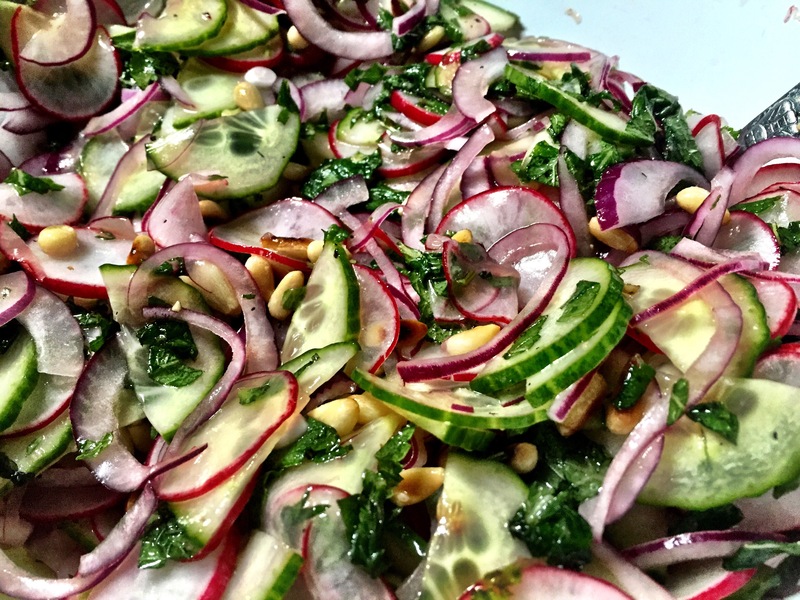 All you do is thinly slice a load of radishes, a whole cucumber and some red onion and dress it with a dressing made from olive oil, honey, lemon juice, orange blossom water, mint, and seasoning. Just mix it all up and add some toasted pine nuts. Serve it straight away. If you leave it too long the acid in the dressing will draw moisture from the cucumber and it will get wet very quickly. This is one of the best salads that I’ve had for a while and it accompanied the Saffron and Lemon Chicken beautifully.